The Crystal River is a tributary of the Roaring Fork and is an often overlooked piece of water due to it's proximity to the Roaring Fork, Frying Pan and Colorado Rivers. This river is full of Rainbow and Brown trout, as well as the Rocky Mountain Whitefish. Love them or hate them, "whities" love to eat a fly and will often put a much needed bend in a fly rod during a troutless period of the day. The Crystal is a freestone in every sense of the word. During runoff, this river runs and high and hard and can be virtually unfishable. During low water years, this river can slow to barely a trickle. Due to the instability of water flows, bug life is not as prolific or consistent as other rivers in the area. The trade-off however, is that this river doesn't see near the fishing pressure as other rivers in the area, which results in fish that are often quite eager to please. A dry/dropper rig is the perfect setup for most summertime situations. The Crystal is most productive during early-mid summer and can provide a welcome refuge from the crowds of anglers often found on other nearby rivers. During the summer months, anglers can expect to primarily see caddis, mayflies, and some stoneflies. Due to the lack of pressure, attractor patterns such as stimulators and PMX's work quite well. Terrestrial patterns such as hoppers, beetles and ants will also put fish in the net during the warmer months of the year. If no hatch is present and the fish aren't responding to attractor dries or terrestrials, fish the nymph versions of caddis, small stoneflies and various mayflies. The crystal river starts above Marble and flows northward to Carbondale where it converges with the Roaring Fork. The most unique aspect of this river is the huge chunks of Marble strewn throughout the upper river. 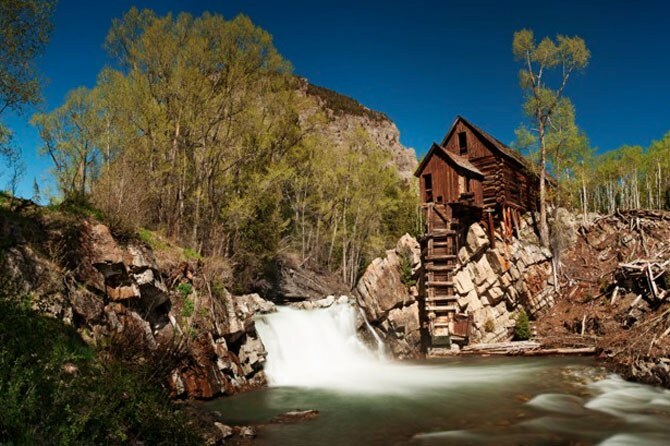 The river gets very little pressure because most fisherman concentrate on the gold metal waters of the Fryingpan and Roaring Fork Rivers. - Satank: Just northwest of Carbondale; take Hwy 82 north and turn south onto Satank Road. Road will end and there's a parking area. You can fish the Crystal to the confluence with the Roaring Fork. - Staircase Park: Turn off Hwy 133 and drive behind the 7-11 and City Market. You're looking for Crystal Village. Turn in at the entrance and turn right on Oak Run. After about 1/4 mile look for a walkway down to the river and a park. - There are numerous access if you drive upstream and look for public access on National Forest lands.